The dyeing process is finally finished, I really enjoyed it, the wool has come out a gentle, light reddish brown colour with flecks of grey (that aren’t showing up in the photos at all) but I can see them and I am so happy they are there. It has a whole Autumn feel to it… I think I’m going to cast on my Tea Leaves Cardi tonight, I can’t wait!! I have never knitted from such a huge pile of wool before, I dyed an extra 3 skeins for just in case. The super wash wool is finished being spun, I was going to knit a hat, but Kye has asked for ‘white mittens’ instead, (he loves the book called The Mitten) so I am going to offer this skein as a giveaway. I will announce a winner on Saturday in this post. Hope your day is filled with some kind of wonderful. Tell Kye that he’ll have to be sure and be careful… we know what happened to the mitten in the story. Then again, maybe that’s what he’s hoping for?! 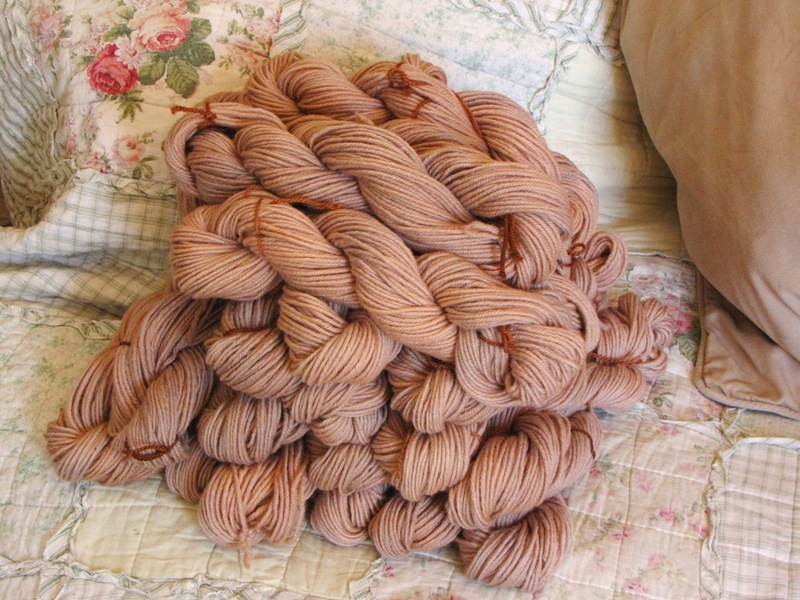 I love the colour of the yarn you have dyed, shouts autumn to me too – what dyes did you use? Gorgeous, look forward to seeing it knitted up. Look forward to seeing the rhino. Ohh, Oooooh, Me! I love the colors in our rainbow!!! Your wool looks so beautiful. I love the colour it came out. It will make such a beautiful sweater! My pottery that came out of the kiln last night was fall inspired too, even though we are just going into spring. Look at thoe vibrant colors! I can already see it as a color changing cowl or scarf. Thank you for the opportunity. I’ve never dyed wool, but I would think that the greatest part of the thrill of it is the element of surprise. Your animal patterns are amazing! I just don’t know how you keep coming up with them! And thanks, not just for the giveaway, but for all the patterns you so generously give away on your sidebar. There’s something for every occasion! Thank you for the giveaway Linda. Oh I’d love to win a handspun skein of yarn! Since I handspin myself. I really appreciate the work that goes into making it. I haven’t spun superwash wool before. I have only spun alpaca. I made my son a set of mittens from the book the Mitten before and amazingly after a year they are still clean! I made them from alpaca and my boys really love them. Wow, that yarn shouts with enthusiastic color and cheerfulness; thanks for the give away. Ah, the tea leaves cardigan. I have had my eye on the pattern for a long time but have never taken the plunge to knit it. I will be excited to see your in all it’s Autumn glory. I’d love to win. The rainbow yarn is gorgeous! Your skein looks magnificent and my girls love rainbows. I would love to win it! How thoughtful Linda, I would to have my name put in for a chance. Oh, I’d love a chance. Thank you, Linda! Lovely! Would like to win, too! I can’t wait to see your rhino and sweater! I dyed yarn for a sweater once. Knit the whole thing. And then decided it was waaaaaay too big and frogged it all. Bleh. Linda, your yarns are awlays so beautiful! My little one is very into rainbow everything at the moment, so this would be perfect. Thanks for the chance. Oh and we love The Mitten too, but right now we are glad to be finally putting the mittens away. I would love to win this yarn! Is so beautiful! Oh Linda! It is sooo pretty! I would love to make somethign with this yarn! Yes pretty please!! Would LOVE some beautiful yarn! I love working with Merino wool, and your hand-dyed is fabulous!! 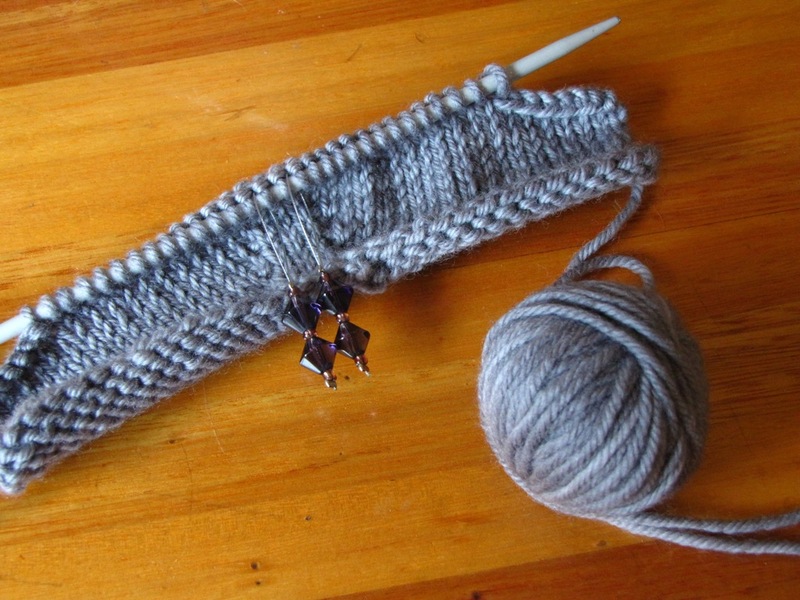 I am casting off a sweater for my daughter today, and casting on a pull-over sweater for myself today as well! Ohhhh!!! !I want the rainbow merino wood giveaway!! !I know I livwe so far away from you but I always read your blog! I WANNA HAVE THIS GIVEAWAY!!!!!!!!!!!!!!!!!!!!!!!!PLEASE??? I’d like to win the rainbow yarn!!! Thanks for the giveaway. How how lovely. I know a little one who could sport a colorful hat and booties with this yarn. Of course I’d like to win wool. I mean…wool. Love!!! Someday I will learn to spin. Meanwhile, your yarn is gorgeous! Thanks so much for the chance. Your rainbow yarn is beautiful! We’ve love to make something yummy with it! I check out your blog everyday, you are so creative! I love the rainbow yarn and have some awesome ideas, I would LOVE to win it!!! however I am not so good with the computer, and I do not know how to enter?!?!? This would be terribly fun to knit. I love your patterns and your blog. I made 2 of your bunny pattern toys and one ended up hopping out of Nana’s house by its ears. I hope it survives. I would love the yarn to continue making gifts for my 6, soon to be 7 grandchildren. I would love to win this beautiful yarn ,don’t think I have ever worked with any thing that looked so plush…….and I just had my 65th B-Day and it would be so appriciated . I would make someone a beautiful gift ! oh the wonderful places to go with this yarn! Oh! I would love to have this beatiful skein of wool!! what wonderful wool to be giving away – absolutely beautiful- we would love to win it (my daughter and I) she has wished for a new shawl and it would be just perfect. thank you for your wonderful blog, i always find another little bit of inspiration here- especially with the spinning- i have inherited a very old spinning wheel and am just starting to learn…. exciting times ahead! Oh my. That hand spun rainbow wool is gorgeous! Yes please, enter me! What beautiful colors! I love the one you dyed as well. One day I want to spend some time doing that. Thanks! Thank you for such a beautiful giveaway. I admired your yarn in the pic as you were spinning it. Crossing my fingers. Many thanks. Well, I had told myself that I couldn’t buy myself any new yarn, as I really should be spinning my own. But this is a giveaway, and it is still handspun, so I think I can get away with it! Beautiful yarn and colours. Looking forward to your tea leaves too. the yarn is delightful would love to create something with it. What beautiful yarn! I’ve never worked with anything other than ‘store bought’ yarn. Would love to win this! That’s beautiful wool, it would be amazing to win it. The tea leaves cardi is beautiful. If I didn’t know that that style of cardigan looks awful on me, I’d knit it myself. Oh I would love to win that gorgeous skein of yarn. The colors are just so yummy looking. I love the yarn! You are so gracious for giving it away. 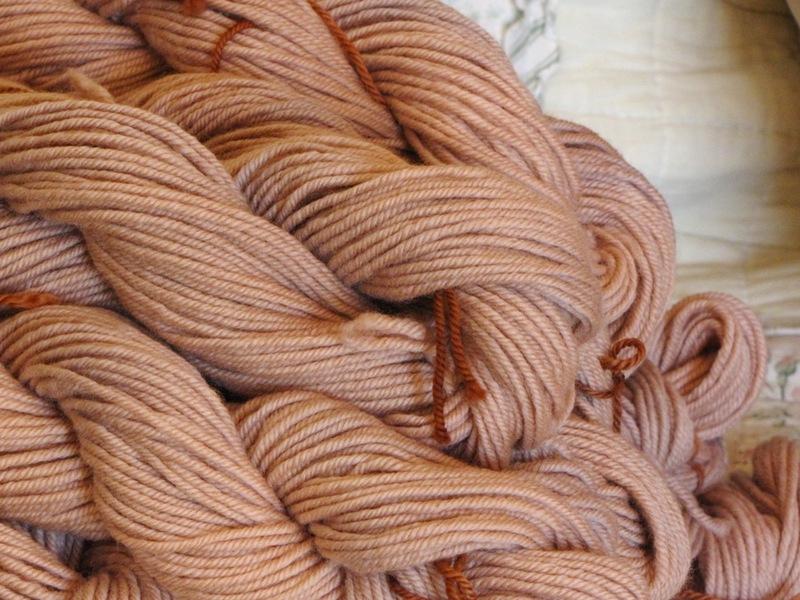 I’ve never used hand spun yarn before, but REALLY want to!! After 15 hours of prepering Passover meal for tummorow evening your rainbow open my eyes and my heart. It’s realy beautiful.I wish it will be mine. That yarn is so gorgeous!! How lovely of you give it away. I <3 rainbow everything. Your blog is pretty amazing, thank you for sponsoring this giveaway! Gorgeous color! Dying wool from my own sheep is on my bucket list…just need to make the time!! Can’t wait to see your Rhino! Your wool is so beautiful and vibrant, I can only imagine how soft it is. I would love to have the honour of using some. Thanks. That yarn is beautiful. I don’t spin but have always wanted to try handspun yarn. Thanks for the chance for a giveaway. i have the perfect thing to do with this beautiful skein. just can’t say in case the intended person is reading. thank you for such a perfect Easter present for the winner. i hope you have a very Happy Easter. I would love this yarn! The colors are so bright and cheerful. Let me start by saying, as soon as your Rhino is finished, guess who will be buying the pattern? I am SO excited to see the finished Rhino. Now, back to this GORGEOUS yarn, THANK YOU for offering this giveaway. I would love to be the lucky winner. I have never knit with yarn that looks so delicious. This is an absolutely amazing yarn. I’d enjoy having such a beautiful homespun piece of work, I can just imagine the beautiful things that I’d make with it. Hmmmm….yes please 🙂 Love your tea dyed wool, and can’t wait to see the finished product. And thanks for the giveaway, I would love to knit something up with it. Yes, dear one. I will throw my hat into the ring for that rainbow. I am sure that my head will break through the water soon, and I will be able to do something – new. Meanwhile, I lurk and read you and admire everything and come away refreshed. The rainbow yarn looks delicious! What pretty yarn I would love to win. Can’t wait to see your Tea leaves cardi. Oh, I LOVE color! And I’m having such a good time following your blog and your knitting! Blessings to you! hi linda, you are the most generous person. thank you for offering this, it would be a true pleasure to knit with your handspun. i have just cast on for my own tea leaves (finally) it’s been in my queue for a long time. how fun we’ll be making them at the same time! Can’t wait to see the Tea Leaves cardi = it will be beautiful in that wool! Please, please enter me to win your gorgeous wool. It looks so happy! Such a gorgeous yarn! I’d be happy to make a hat for my daughter with it. Oh I love the beautiful colours. I’d love to win some yarn. I have never seen or felt a hand spun yarn before. Wonders The charm of the un uniform thickness would feel the same as u eat a bowl of handmade noodles! So so gorgeous! I would love to use that for my doll’s hair! Yummy! 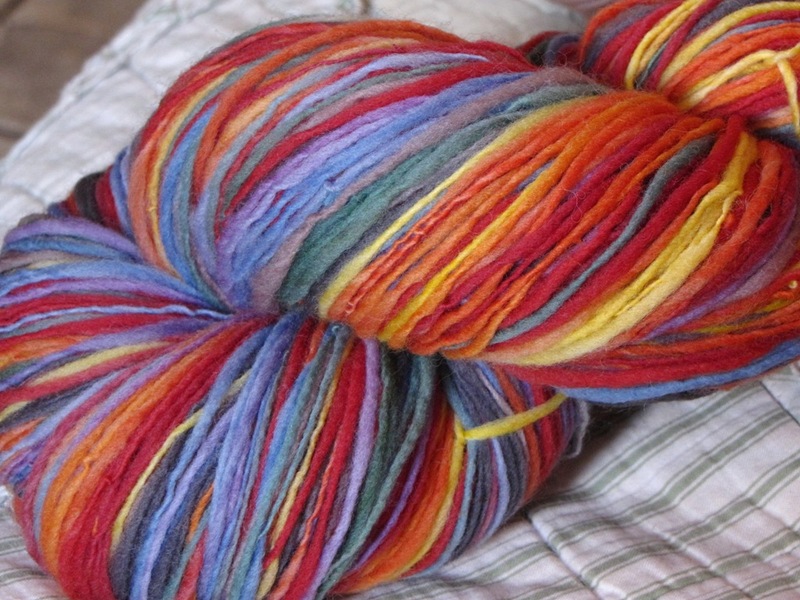 Such vivid and lush looking Rainbow yarn, I’d love to knit up the promise of a rainbow with this skein. P.S. I love the dainty stitch markers in your picture of the upcoming knit Rhino pattern. Wishing you all the best! its beautiful, thank you for the chance! Wow what a fantastic giveaway! I would love the chance to win! Love the stitch markers and the knitting is looking good! How very kind, I absolutely adore that wool. Thanks for the chance to win. Lovely yarn, it will make a fab tea leaves cardi. I LOVE the rainbow yarn, it is so happy and beautiful. What beautiful yarn! I would love to be in the drawing. And I’m interested to see what you are knitting there! Can anyone join in or is this restricted to one part of the world? I’ve never owned rainbow coloured yarn and that looks lovely. I just learned to spin so I really appreciate the loveliness (and evenness!) of your yarn. Love the rainbow colors too. I also really love the deying you did dro the tea leaves cardi. It is even the color of tea. Can’t wait to see the sweater. oh, it’s such a beatiful yarn. i would love to knit a yarn you had spun. it would make the article that much more special. Oh,what beautiful colors. Colors make the world a much happier place…thank you for the thought of sharing them with us all. I think kindness and giving all go with wonderfully dyed yarns, goood luck to everyone. I love how the color turned out for the tea leaves cardi yarn! That yarn is gorgeous. Thanks for the chance to win it. The yarns are gorgeous, I’d love to be included in the giveaway. Thanks for having it, and good luck everyone! Gorgeous yarn! I love the elephant pattern too. Thanks for sending it so promptly. I made some cabled mitts with the yarn I got last time! What beautiful colors! I can see a baby sweater in it! The Tea Leaves yarn will be such fun to work with – calming, I would think! I am half-done with a Lion Brand Simple Top-Down Cardi in navy/lime green Malabrigo. It’s so relaxing to work with a soft yarn, isn’t it? Pick me, pick me! Who doesn’t want to win rainbow merino wool?! pretty! i love merino wool! The rainbow wool is beautiful. I would love to make something from it. I would love to win, thank you for the opportunity! The colour of your dyed yarn is so lovely and gentle. Brown is a favourite of mine – that earthy shade. Really look forward to watching your cardigan grow from your yarn. A rhino – hooray! Your handspun is so vibrant. Really beautiful. We love the Mitten too. Such a wonderful little story. White mittens will be good fun. Love to you all and wishing you a precious Easter weekend. Beautiful wool! I’ve just started following your blog and am so inspired by all you do. I love your knitting patterns – so fun. Maybe not too late? You didn’t say what time…I’d love that rainbow skein of yarn!!!! Oh, I would love to win this…I need some inspiration. Reminds me that I need to make something for my color loving autistic grandson. Thanks for the opportunity to win this beautiful, inspiring yarn. Oh my word, it’s stunning – what a lovely item that will be when it’s worked. I would love to show you when I’m done… wink, wink, nudge, nudge.